If there is one thing I never tire of, it is a summer salad. I sometimes question if a salad is really a recipe or is it more of a compilation of ingredients that do not actually highlight any cooking skill? There are times when I don’t really feel inspired by a collection of ingredients assembled into a bowl or onto a plate but then I think of all my favourite classic salads and I realise that they are classics for a reason. How could I live without a Salade Nicoise, Tabbouleh or Insalata Caprese? Then I think of the delights of a Caesar salad and I appreciate that a salad is, or can be, a skilful timeless plate of food with a dressing that is so addictive. Bold, salty, pungent flavours that I adore. So when Rennie asked me to create a recipe for their #SummerTreats campaign, I knew I would take my inspiration from this much loved creation. My take on the classic Caesar salad replaces lettuce with lots of summery char-grilled Mediterranean vegetables. 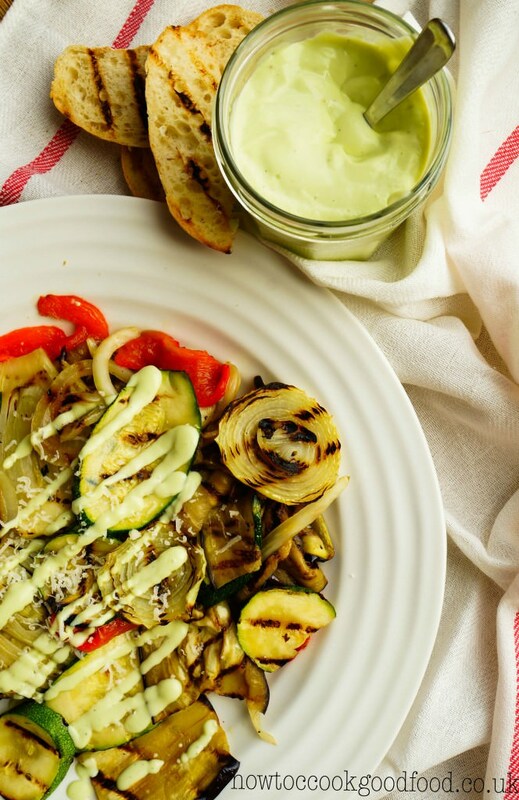 The rich, creamy garlicky sauce is replaced with an avocado and yoghurt caesar dressing. The dressing retains it’s creaminess but is a far lighter version of the original. The final touch for this super summery salad are some char-grilled ciabatta croutes which are rubbed with garlic after char-grilling. They soften slightly and absorb the dressing, providing the salad with some body and texture. This recipe makes a jar of dressing but can be kept in the fridge for a few days. It doubles up brilliantly well as a dip for crudites and would be delicious as an accompaniment to tacos, quesadillas or a spicy chilli. I am linking up to No Croutons Required (Lisa’s Kitchen & Tinned Tomatoes), Simple and in Season (Ren Behan) and Extra Veg (Utterly Scrummy & Fuss Free Flavours). For more #SummerTreats recipe inspiration why not check out Sarah’s Pimm’s Layer Cake or Emily’s Seared Tuna. Put the aubergine, courgette, fennel and onion in a bowl and coat with olive oil. Char-grill these vegetables in a griddle pan or on the BBQ until they are cooked. Griddle the ciabatta croutes then rub the ciabatta croutes with the garlic and set aside. Assemble all the vegetables onto a serving dish and scatter the ciabatta croutes. Whizz up the garlic, Parmesan, avocado, yoghurt, lemon and seasoning in a blender. Pour some of the dressing over the salad and save the rest (in a jar) for another time. OOoh this sounds positively heavenly, and those grilled onions are calling my name! 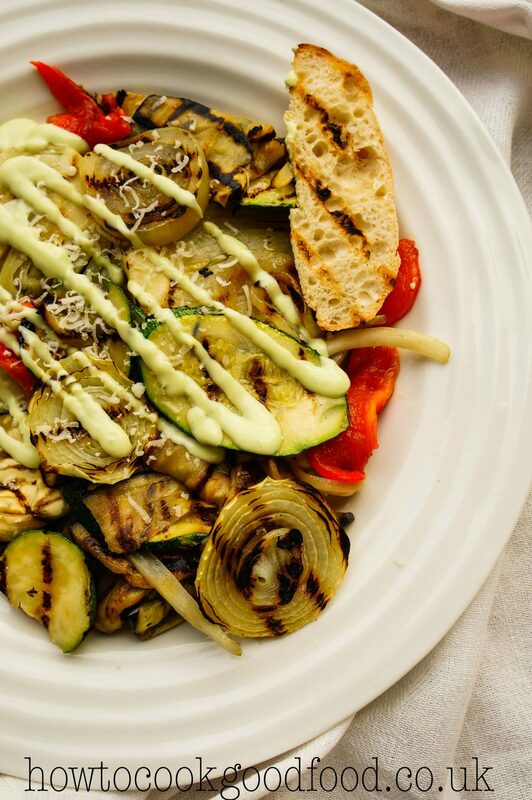 Make this kind of grilled salad a lot but totally bookmarking this delicious dressing. Overused but heartfelt …. yum! Great Sally, the dressing certainly is worth trying! This sounds gorgeous. I love the idea of replacing lettuce with roasted vegetables – so much more tasty! And the avocado dressing is definitely something I want to try. Thanks Corina, I do love mixing up recipes, especially in the summer. 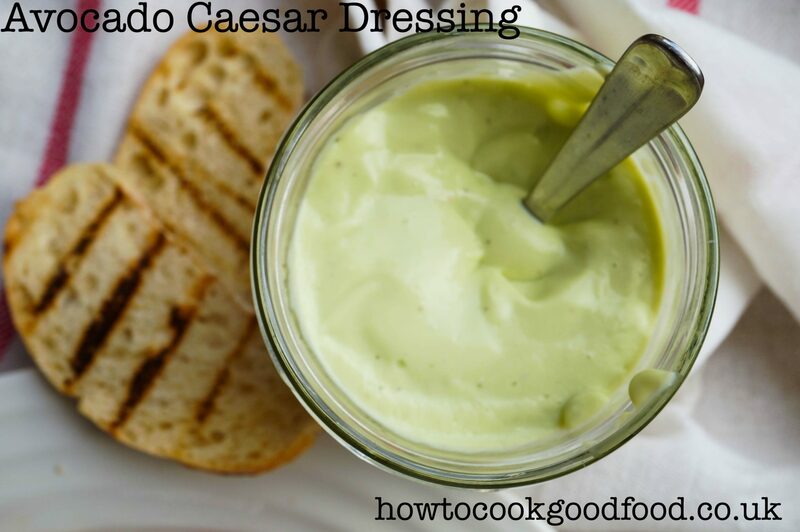 The avocado ceasar dressing is genius! I am so making that. Thaat looks amazing Laura. May I have this for dinner tonight? I will DEFINITELY be trying this. Like your choice of veg too. Stumbled, pinned and tweeted! I absolutely love the idea of this dressing and I’m definitely going to try it I just need to buy some Avocados! Thanks Diana, I hope you enjoy it! your dressing sounds so good! I must try this soon on a summer salad. I adore chargrilled veg too. 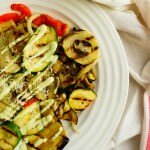 chargrilled vegetables are such a great side dish and this dressing with the creamy avocado is genius. v impressed and lovely pics Laura. Thanks Nazima, I do love roasted veggies at this time of year! I’m going to keep note of this recipe. I”m sorry that I can’t include this recipe in the NCR roundup because we only accept one submission per blogger each month. Mmm, this looks wonderful. Love the sound of the avocado dressing. That is such a lovely recipe Laura. I think I could eat a jar of that dressing with a spoon. Thanks for sharing with #Extraveg and sorry it too me so long to come and comment. No worries Helen, the dressing is the best bit!